The previous Pony Express station I told about in this series was Buckland’s Station. It served as a Pony Express station for just a short time between April 3, 1860 until the Pyramid Lake Indian War started about May 12, 1860. For the next two months, service on the Pony Express was disrupted by periodic Indian attacks on several of the riders and some of the stations. Service was sporadic at best during this time and full regular service was not resumed until a new station was established in the administrative office at Fort Churchill. Meanwhile Buckland’s Station continued to be used as the Overland Express and Pony Express station. Even after the relay station was moved to Fort Churchill, the Buckland Ranch provided livestock and hay for the Pony Express. Fort Churchill was named in honor of Sylvester Churchill, the Inspector General of the United States Army. Captain Joseph Stewart, a leader of the second battle of the Pyramid Lake Indian War, and the Carson River Expedition were ordered to construct the desert outpost to guard the Pony Express run and other mail and travel routes through the region. Construction started on July 20, 1860 using stone foundations, adobe walls and wooden roofs to build a compound in a square shape enclosing a central drill and parade ground. Several hundred soldiers were based here patrolling the routes taken by overland travelers and mail routes until the danger of Indian attacks no longer existed. 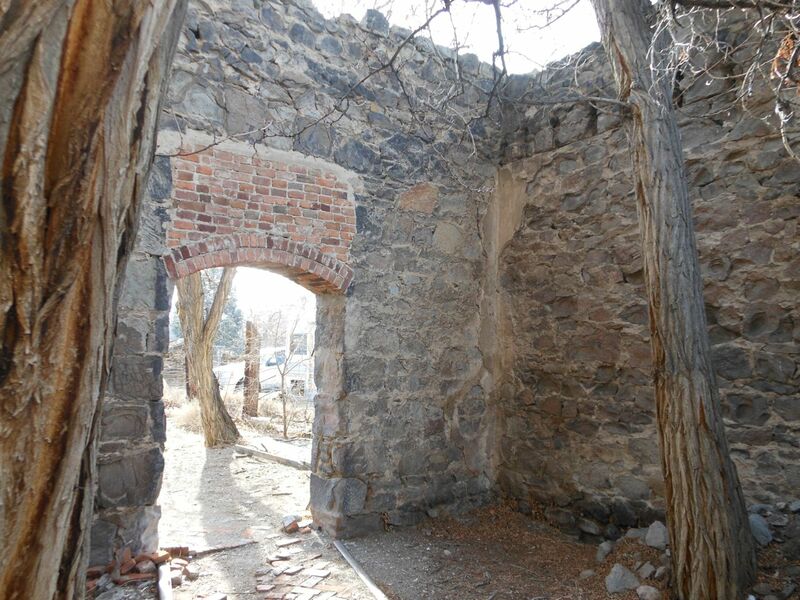 The fort was abandoned in 1869, and over 20 adobe buildings were auctioned off to Samuel Buckland for just $750. In 1884, the remains of soldiers buried at the Fort Churchill cemetery were relocated to Carson City. Graves remaining at the fort today are those of the Buckland family whose nearby ranch sold supplies to the fort. Samuel Buckland salvaged much of the wooden material from the abandoned fort to build the still existing two-story hotel on the site of his original log cabin Pony Express station. The State of Nevada was offered a chance to acquire Fort Churchill in 1871 but declined the offer. In the early 1930s the Daughters of the American Revolution became interested in preserving the fort and were able to have 200 acres of the property transferred to the State. The National Park Service became involved and the Civilian Conservation Corps (CCC) made several preservation improvements to the once proud fort and constructed the Visitor Center that is still being used. In 1957, the fort became a part of the Nevada State Park System. For several years, efforts were made to repair the adobe walls, including casting new adobe blocks to reconstruct portions that have simply melted away from rain water and erosion. My landscape company submitted unsuccessful bids to perform some of this work. Several of the walls are now nothing more than rectangular mounds of dried adobe mud. Other buildings have been preserved in a state of arrested decay. The park service has set out markers at various portions of the ruins telling what the purpose of many of the buildings was. Fort Churchill State Park and the surrounding area is a popular place for visitors and contains many historical and scenic attractions. The park features a visitor’s center and museum at the entrance where information about how to best see the fort ruins is available. Buckland’s Station is now a part of the park as well as picnicking and camping areas along the tree-lined Carson River. There are hiking trails and places to view wildlife and interesting Great Basin plants. Fort Churchill is located along the Carson River eight miles south of Silver Springs on U.S.95A. The park is 40 miles east of Carson City and 36 miles west of Fallon. Visitors are advised to enter the Park from U.S. 95A on a short, paved access road. While the Old Fort Churchill Road and Pony Express route along the Carson River from U.S.50 is scenic, it is 16 miles long through private property and is unpaved. The next Pony Express station we come to when traveling east along the Fort Churchill Road from Miller’s Station is really the site of two stations serving the same general area. The first one, established in 1860, was Buckland’s Station. At that time, Fort Churchill did not exist. It was not until the summer of 1861, after the Pyramid Lake Indian Wars, that Fort Churchill was constructed to provide a military presence to protect the citizens of the Nevada Territory from hostile Indian attacks. Samuel S. Buckland, originally from Ohio, established a ranch near the Carson River about 30 miles east of Dayton along the Overland Route to California. Buckland and James O. Williams had been partners in several ventures before coming to Nevada and when they arrived here, they both established stations on the Overland Stage route. Buckland built a log cabin and a saloon on his ranch which became known as Buckland’s Station. The stage company kept horses at the station and Buckland furnished livestock, hay, whiskey and other essentials to emigrants, ranchers and travelers. Samuel Buckland constructed the first bridge across the Carson River adjacent to his station. This was the only toll bridge east of Carson Valley to provide a crossing on the river. In March, 1860, Bolivar Roberts of the Pony Express, made arrangements with Samuel Buckland to use his “good-sized cabin” as a Pony Express Station. Buckland was too busy with other affairs to become the station keeper, so the position was taken by W.C. Marley. The place served as a rider-relay, or home station until Fort Churchill was established in the summer of 1860. During the short time between March and July, 1860, several memorable events took place at Buckland’s Station. Robert “Pony Bob” Haslam regularly made his run from Friday’s Station at Lake Tahoe to Buckland’s Station, a distance of about 75 miles. A few days later he would make the return trip. On May 10, 1860, Pony Bob completed his regular run from Friday’s to Buckland’s, where he expected his relief rider would be waiting. The rider, Johnson Richardson, had heard of Indian troubles east of Buckland’s, including the massacre at Williams Station, and refused to take his turn carrying the mail. The station manager offered Haslam extra money to continue the route, which he gladly accepted. Pony Bob rode all the way to Smith Creek, then after resting nine hours, he made the return trip to Friday’s, making the longest run in Pony Express history. While Pony Bob was making his famous longest ride on May 11, the quickly formed militia from Carson, Dayton and Virginia City stopped and stayed at Buckland’s on their way to avenge the attack of Williams Station. When they continued on their way, they took the Pony Express horses with them. Four days later, the badly beaten survivors of the first battle of the Pyramid Lake Indian War straggled back to Buckland’s Station. Among the surviving volunteers was John “Snowshoe” Thompson. Of the 105 volunteers who participated in the campaign, 76 were killed, including their unofficial leader, Major William Ormsby. This was the most serious Indian battle in the history of Nevada. The Pyramid Lake Indian wars and repeated attacks on Pony Express stations and riders across the territory caused a disruption in regular mail service by the Pony Express for the remainder of May 1860 until July when service once again resumed. Fort Churchill was established during the summer of 1860 to provide some protection along the route and a military presence to deter hostilities. Once Fort Churchill was established, the Pony Express station was moved about one mile west of Buckland’s to the fort headquarters. Samuel Buckland continued to operate his station and raise livestock, hay and other crops for the Pony Express and the Overland Stage Company. The next documented Pony Express station to be encountered when traveling east from Dayton was known as Miller’s Station. It was a wooden structure located about 8 miles east of Dayton along the Old River Road and the Fort Churchill Road. It had been one of about 20 or more rest and supply stations that were established along the Carson River branch of the California Emigrant Trail in 1849 and 1850. After serving emigrants bound for the California Gold Rush for over 10 years, it became a Pony Express relay station when the service started in 1860. Ownership of the station changed on July 1, l861 when it was purchased by G.W. Reed. The station remained under his ownership until the Pony Express ceased operations in November, 1861. Today nothing remains of the station since the lumber in the building was used elsewhere. I have seen reports that a well still exists on the site. Both sides of the road are posted with NO TRESPASSING signs and there are a few farms and ranches along the way. When I visited the area recently, I was not able to determine the exact location of the original station. On May 10, 1860, when pony Bob Haslam stopped at Miller’s Station on his famous longest ride in Pony Express history, he was unable to get a fresh horse for the next leg of the run to Buckland’s Station. There was no change of horses available for him there since the white militiamen from Carson, Dayton and Virginia City had seized them to use in the first battle of the Pyramid Lake Indian War. Haslam continued on to Bucklands using the same horse he had ridden to Miller’s. It would be over a month before hostilities subsided enough to resume regular service on the Pony Express. Back in 1849, a large party of pioneers was making its way across the Nevada desert to California. One of the families was the O’Brien family, consisting of a father , a mother, a 12-year old son named Mike and a 15-year-old daughter named Susan. Along the way, near what is now the Utah border, a band of Indians attacked the group. The men of the wagon train were away on a hunting trip to obtain food. Young Susan showed extreme courage by pulling out two guns the family had hidden away and turned them on the intruders. When the Indians saw the resolve of the girl, they backed away and left the encampment. The O’Brien family led the way on the dusty California trail to Ragtown near present Fallon, Nevada where they followed the Carson River Trail west to a place about 5 miles east of Miller’s Station. When they reached the present site of the Break-a-Heart Ranch, another group of Indians attacked and killed the mother, father and brutally tomahawked 12-year-old Mike. Susan hid herself in a trunk in one of the wagons until the Indians found her there. They then dragged her to the top of a plateau where they were camped. Susan was badly scratched in the brush and rocks as she was dragged along the trail to the plateau where the Indians gave her to the chief of the band. Later that night when it seemed her captors were all asleep, brave Susan decided to make a dash for freedom. As she started running away, the guards heard her and started chasing her. Being badly injured, she was determined to escape rather than be taken alive. She ran straight toward a steep, rocky bluff overlooking the Carson River. With her last ounce of strength, Susan hurled herself over the cliff to be smashed to death on the rocks below. When the other wagons in the party finally reached the scene of the tragedy, they buried Susan O’Brien and the other victims of the massacre. They named the cliff where she made her final plunge “Susan’s Bluff” in her honor. Susan’s Bluff can be reached from Virginia City by taking Six-Mile-Canyon Road to Hwy. 50, then across the Highway to Fort Churchill Road. The total drive that goes past the site of Miller’s Pony Express Station to Susan’s Bluff takes less than an hour. In 1849, Abner Blackburn and other prospectors heading to the California gold fields discovered the first Nevada gold where Gold Canyon reaches the Carson River at a place that later became Dayton. In the early 1850s, Spafford Hall constructed a log station and trading post to accommodate the needs of emigrants bound for California along the Overland Trail. Hall’s Station became the center of activity for the Dayton area and was the place where the first dance ever held in Nevada Territory occurred on New Years Eve, 1853. An inside glimpse of what remains of Dayton’s Pony Express Station. In 1854, Spafford Hall was seriously injured in a hunting accident and sold the Station to one of his employees, James McMarlin. Later on, the station was purchased by Major William Ormsby sometime between 1854 and 1860. Ormsby was a supporter of constructing the overland stage route through Nevada Territory and wanted Hall’s Station to become a stage stop for the Pioneer Stage Line. In April, 1860, when the Pony Express started operation through the territory, Hall’s Station became Dayton’s first Pony Express Station. Since the Pony Express route did not run through Gold Hill or Virginia City, any mail for the Comstock was taken off at Dayton and brought to the Comstock by a separate carrier. Shortly after the Pony Express started operating, the Pyramid Lake Indian War began. Station owner Major Ormsby was one of the 76 men killed in the first battle of the war on May 12, 1860. This disrupted Pony Express mail service for nearly two months until riders were once again able to make the runs with any degree of safety. Many of the Pony Express Stations east of Dayton were attacked by the Indians. Since several of the Pony Express stations out in the desert regions of the territory were burned during the time of hostile Indian attacks, the log structure at Hall’s Station was likely considered too vulnerable to remain the Pony Express Station. With the death of Major Ormsby, the Pony Express Station for the Dayton area was relocated to a more substantial stone walled building alongside the present location of the Union Hotel. This was the station for the Overland Stage stop and it then became the second Pony Express Station in Dayton. It remained the station until the Pony Express ceased operation in 1861. The site of the original Hall’s Station was destroyed during the 1930s when it was excavated for a gravel pit and some gold mining activity. Historical marker located near Dayton’s Pony Express Station. 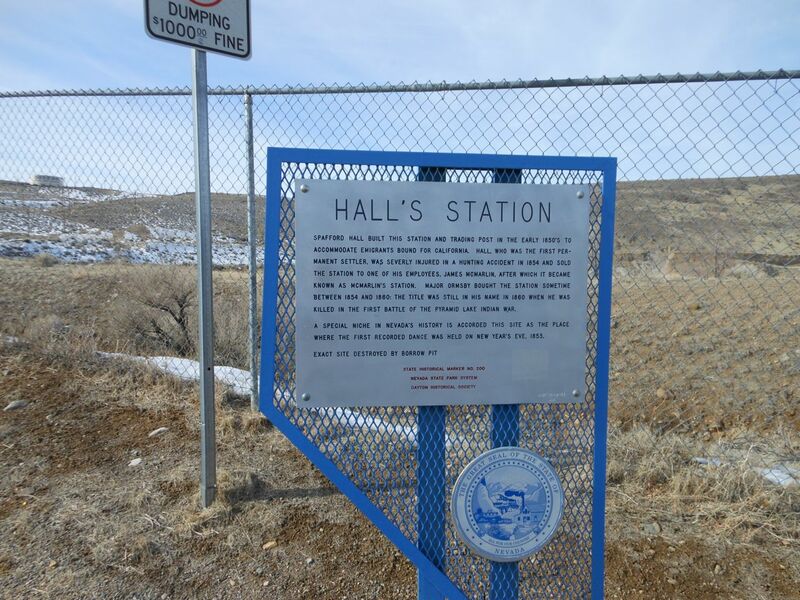 There are historical markers near the site of Hall’s Station and on the Union Hotel and post office building. Both of the sites are now on private property. There is a freestanding rock wall alongside the Union Hotel that was the original wall of the overland stage station and the Pony Express Stop. Originally, the Union Hotel was located across the street near the Odeon Hall. When the hotel burned down in 1870, it was re-built alongside the old stone wall which has remained intact ever since. This massive wall can be seen along the west side of the hotel. A better view can be seen from the rear of the hotel where much more of the wall is visible. By 1851, a trading post and a small ranch were established on the Carson Branch of the California Emigrant Trail in what is now Carson City. Frank Hall, W.J. Hall and George Jollenshee operated the station near what is now Fifth and Thompson streets. They called the place Eagle Station due to a large stuffed eagle that had been shot by Frank Hall mounted on the wall of the station. The property operated as a successful stopover for travel weary gold prospectors headed for the California gold fields. In 1858, Abraham Curry bought Eagle Station after he found lots in Genoa to be too expensive. Curry was a man of incredible vision who believed the area surrounding the property he had bought would some day become the center of activity for the region. Curry set out city streets and a 10-acre plaza for a future city center with the prediction the place would become the territorial capital. One year later in 1859, gold prospectors in the hills east of Carson City discovered one of the greatest silver strikes in world history. Tens of thousands of miners and other fortune seekers poured into Carson City, Virginia City and the Comstock region. Abraham Curry later became the driving force to have a branch of the United States Mint established in Carson City to coin the gold and silver from the Comstock mines. By 1860, Carson City was a regular stop on the Overland Mail route serving both the Butterfield and Wells Fargo Stage lines. When the Pony Express started operation, their regularly scheduled stop was at a hotel on Carson Street near where the original Ormsby House later stood. I have never found out the name of the hotel where the pony Express relay station was actually located. A nearby historical marker at the corner of Carson and Third Streets indicates the stables and corrals for the ponies were located across Third Street from the still existing St. Charles Hotel, the stage stop after 1862. This building is now the Firkin and Fox Restaurant. There have always been conflicting historical reports on exactly where the Carson City Pony Express stop was located. Many written accounts place the station between Fourth Street and Fifth Street. The Historical Marker at the corner of Third and Carson Streets places the station between Second and Third Streets. Both the St Charles Hotel and the original Ormsby House Hotel were built in 1862, the year after the Pony Express ceased operation. Carson City was named by Abraham Curry after Captain John Fremont’s scout, Kit Carson. In 1860 when the Pony Express began operations, Carson City was described as having just one main street that was little more than a double row of saloons, a few assay offices, a general store and a hotel that served as the relay station for the Pony Express. Nothing remains today of the original buildings of the station. In 1860, a crude boarding house without a name could be described a hotel. In October 1860, Sir Richard Burton wrote in his notes of places he stopped including Pony Express Stations, while traveling along the Overland Trail, concerning Carson City. “After a day’s rest at Carson City, employed in collecting certain necessaries of tobacco and raiment, which intrinsically vile, were about treble the price of the best articles of their kind in the Burlington Arcade…” The Carson City station was the headquarters of the western superintendent, William Finney. When people who travel U.S. Highway 50 near Moundhouse or when they ride the V & T Railroad train between Carson City and Virginia City, they can see a monument commemorating the Pony Express riders just east of Carson City. Located on a hill south of the highway is a metal silhouette of a mounted Pony Express rider created by Carson Valley artist Bill Muerle. The idea for the memorial came from Lyon County Commissioner Larry McPherson, Past President of the National Pony Express Association. He had seen similar silhouettes near Marysville Kansas where these silhouettes greet visitors. The second Pony Express Station encountered when traveling east from Friday’s Station at the California/Nevada State Line is Van Sickle Station at the bottom of Old Kingsbury Grade in Carson Valley. In 1857, rancher Henry Van Sickle constructed a two-story hotel with a bar, kitchen and a store to cater to the needs of emigrants traveling to California as a rest stop before the climb over the high Sierra Nevada Mountains. When the Pony Express started operation in 1860, it became a station where the riders stopped to change horses. This was a transition place in the terrain along the trails the pony riders rode. To the east of Van Sickle’s lay the barren expanse of the Great American Desert. To the west of the station rose the Sierra Nevada Mountains and the steep forested trail nearly all the way to Sacramento. Van Sickle Station was a pleasant, scenic location with the forested mountains on one side and the lush grassy fields of Carson Valley on the other. Nearby hot spring pools were a welcome place for emigrants and travelers to clean up after the tortuous trip across the desert and the filthy conditions of other stations along the way. Just three miles north of Van Sickle’s along Foothill Road is Genoa, Nevada’s oldest settlement. It was originally known as Mormon Station, but it was not a Pony Express Station where mail was exchanged. The pony trail followed along Foothill Road through Jack’s Valley and on to Carson City, the next Station. Several years ago I was installing irrigation lines with a trencher at the Genoa Lakes Golf Course between Jacks Valley and Genoa when I uncovered two small and extremely rusted horseshoes alongside a marker for the Pony Express Trail which crosses the golf course. I took these to the Nevada State Museum to see if archaeologist Donald Hardesty could identify them as being from the Pony Express. He never returned them to me, so I assume they were genuine. Dr. Hardesty has done archaeological excavations on some of the Nevada Pony Express station sites and is considered an expert in this field. Van Sickle Station was quite a lively place during the days of the Pony Express. It was known to cater to all sorts of interesting people who stopped there to frequent the restaurant, hotel and bar. Henry Van Sickle had helped to finance much of the road construction in the area and was the tollmaster of Kingsbury Grade. He was the owner and operator of the station and the surrounding ranch. He became the local agent for the Pony Express when the company decided to use his facilities as the Pony Express Station. In July, 1861 a local troublemaker named Sam Brown got into an altercation at the Station with Henry Van Sickle. Brown was looking to pick a fight with Van Sickle and threatened to kill him in the dining room of the station hotel. Van Sickle knew he had better get rid of this hot headed menace before he or some of his guests were killed or injured. After an unsuccessful attempt to fire a shot at Van Sickle, Brown took off toward the south and Van Sickle took a double barreled shotgun and went after the ruffian. During the chase, several shots were fired until Henry Van Sickle finally encountered Sam Brown at a house in nearby Mottsville. Hearing Brown’s spurs jingle in the darkness, Van Sickle called out, “Sam, now I kills You.” That being said, Van Sickle fired both barrels of the shotgun into Sam Brown’s chest. In 1909, the historic hotel at Van Sickle’s Station, being in disrepair, was torn down. In 1944, a major preservation effort took place at the station. Many of the original hand hewn-beams and stone salvaged from the original Pony Express Station buildings were used to construct a beautiful 11-room stone ranch house. Many other buildings including barns, guest houses and corrals were restored and are well maintained today. Across Foothill Road from the ranch house and other buildings, ruins of stone walls of the original Pony express station can still be seen standing in a pasture. When I first started researching the Pony Express I was not too impressed with the operation and the prominence it held in the history of the American West. The more I read and studied, however, the more I came to appreciate how the Pony Express became so famous. At my first impression, I wondered how this enterprise that lasted just eighteen months and ended not only broke but deeply in debt, could have achieved the apparent legendary status it holds in our history. I have since learned that the history of the Pony Express in Nevada was intricately woven with the early history of the Nevada Territory, the numerous indian wars and the pioneers who came to Nevada to develop the Comstock mines. It served the Territory well to convey much needed communication with the eastern states at a time when no other means of communication was available. I have found the stories of the several Pony Express stations and the riders who made the runs between them to be a fascinating legacy of this bold adventure. For the next few days, my articles will tell about some of the more interesting and well documented Nevada Pony Express Stations. Due to the early date of their existence, the history of some of the stations is sketchy or nonexistent. Many of the stories are fragmentary and the very existence of a few of the stations is suspect. Beginning from the west, the first Nevada Pony Express Station was Friday’s Station located at Lake Tahoe near present day State Line Nevada. In April, 1860, Robert (Pony Bob) Haslam received the first shipment of mail from Sacramento at Friday’s Station and made his first run between Friday’s and Buckland’s Station, 75 miles east. Friday’s had already been established as a way station for the Pioneer Stage Lines following the old Kingsbury Grade and for the next 18 months, it also served as the Pony Express remount stop. Friday’s Station was selected by Pony Express developers Russell, Majors and Waddell due to the location on the main California Trail and the station buildings already in existence. Some writers have referred to Friday’s Station as Lakeside Station due to its proximity to Lake Tahoe. The original blacksmith shop and a historical marker can be seen 3/4 mile east of State Line near Loop Road on U.S. 50 across from Caesar’s Tahoe. It was named for one of the original operators, Martin K. “Friday” Burke. It was a well equipped two story wood frame white building which was a welcome sight to the riders from both east and west who had just completed long runs through steep and difficult terrain. Continuing east from Friday’s, the riders had to make the steep ascent of Kingsbury Grade over Daggett Pass and down into the Carson Valley. The route is now mostly on private property and Forest Service land but it somewhat follows the route of the modern paved Kingsbury Grade highway. At the bottom of the grade was the next relay station known as Van Sickle’s Station near the eastern foot of the grade. This station has been partially restored and will be the subject of a future article. A beautiful bronze statue in front of Harrah’s Lake Tahoe in State Line Nevada commemorates Friday’s Station. The larger-than-life representation of a Pony Express rider was commissioned by Harrah’s Club owner Bill Harrah. The statue was designed by Dr. Avard Fairbanks and cast in bronze in Italy. Similar statues by Dr Fairbanks can be seen near Salt Lake City, Utah and Casper, Wyoming. All along the route of the Pony Express, hundreds of historical markers and statues have been constructed. Much has been written about the Pony Express and the place it has occupied in the History of the American West. Many of the stories written about the Pony Express were romanticized fictional accounts. One true story about the Pony Express that is well documented is the exciting adventures of of Pony Bob Haslam. Born in England in 1840, Robert Haslam came to the United States as a teenager. At age 20, he was hired by Russell, Majors and Waddell, founders of the Pony Express, to help build the Pony Express stations through Nevada. April 3, 1860 was the official beginning of service for the Pony Express with riders leaving eastbound from San Francisco and westbound from St. Joseph Missouri. Robert Haslam, later to be called “Pony Bob” was assigned to the run from Friday’s Station (State Line Nevada) to Buckland’s Station near present Fort Churchill 75 miles east. 1860 was a historically important year in the History of Nevada. At that time, what we now know as western Nevada was part of the western Utah Territory. This region was loosely called Washoe due to the Washoe Indians who had inhabited the area for centuries. Following the discovery of silver in the Gold Canyon and Virginia City area in 1859, the “Rush to Washoe” was in full swing by the spring of 1860. At the same time, on April 3, 1860, the Pony Express started operation through this region. Then, in May of 1860, the Pyramid Lake Indian War started when Williams Station east of Bucklands Station was attacked by the Paiute Indians. Robert Haslam began his assigned run from Friday’s Station to Buckland’s beginning with the very first cross country run of the Pony Express. On May 10, 1860, he received the east bound mail at Friday’s Station and headed east through stations at Carson City, Dayton and Miller’s before reaching Buckland’s. When he reached Buckland’s Station, he found the relief rider was so badly frightened over the threat of Indian attacks that he refused to take the mail. Haslam agreed to take the mail all the way to Smith Creek for a total distance of 190 miles without a rest. After resting for nine hours, Haslam took the mochila filled with westbound mail and retraced his route back to Bucklands. Along the way he found that Indians had raided the Cold Springs Station killing the station keeper and running off all the stock. Without changing mounts, he continued on to Buckland’s. The trip was a total of 380 miles, making it the longest trip in the history of the Pony Express. Not only did Pony Bob Haslam complete the longest ride in history, but he also participated in completing the fastest trip ever made by the Pony Express. People in the American West were so far removed from the seat of government in Washington D.C., they were eager to receive news of a political nature as quickly as possible. In March 1861, Abraham Lincoln delivered his Inaugural Address. Whether people in Nevada and California supported the Union or the Confederacy depended largely on the policies set forth in Lincoln’s address. Pony Bob Haslam was the rider who delivered the news of Lincoln’s election and he was the rider who delivered the the inaugural address to Fort Churchill where it was telegraphed to Sacramento and San Francisco over a little known newly installed telegraph line called “Fred Bees Grapevine.” This was on November 14, 1860, just seven days after the news left the east. After the Pony Express ceased operations in November 1861, Pony Bob went to work for Wells Fargo & Company as an express rider on the route between Virginia City and Friday’s Station for more than a year. When the Central Pacific Railroad reached Reno, he made the run from from Virginia City to Reno for about six months. He routinely made the twenty three mile run in just short of one hour. After telegraph lines were completed connecting these cities, Haslam was transferred to Idaho where he continued working on a route between Queens River and Owyhee River. Pony Bob saw and experienced many tragedies during his career as a Pony Express rider. He had suffered being wounded by Indians and while in Idaho, his route passed by a place where ninety Chinamen had been massacred by Modoc Indians. Their corpses were still on the ground. Bob Haslam resigned and retired from express riding the Idaho Route. Sye Macaulas took over the route and was killed by Indians the first time he covered the route. Eventually, Bob Haslam left the west and became close friends with Buffalo Bill Cody, who had also been a Pony Express rider. Haslam settled in Chicago where he was associated with the management of the Congress Hotel Association. Pony Bob Haslam died at the age of 72 in Chicago in February 1912.